Economic Development | Williamson, Inc.
It’s easy to see why Williamson County continues to rank as a top community for site selectors, entrepreneurs and talented workers. The county’s schools, recreational facilities and housing options are among the best in the nation. Our business-friendly atmosphere and large pool of well-educated employees have lured some of the biggest brands on the planet, like Nissan North America, Mars and Verizon. 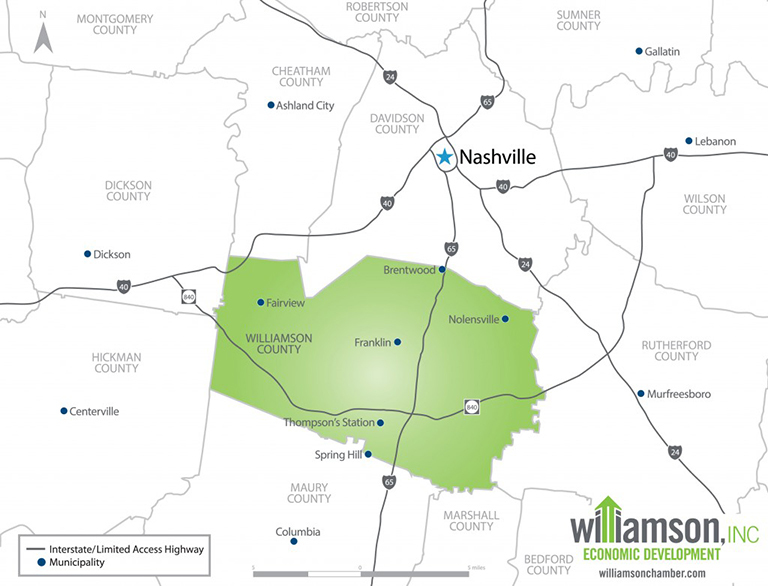 In fact, 12 of the top 25 largest publicly traded companies in the Nashville region call Williamson County home. We offer the lowest county tax in the Nashville Metropolitan Area, no state income tax and plenty of opportunities to break new ground. More than 54% of our residents have college degrees and 21% are entrepreneurs. Come see what Williamson County has to offer and why doing business here is just better. Williamson County is Nashville’s Neighbor – Nashville is a thriving community filled with risk-takers. The strong entrepreneurial spirit, coupled with the music and entertainment industries, ensures a vibrant “creative class” that helps make the Nashville region an exciting place to live, work and do business. The Nashville region is home to more than 1.8 million people and 40,000 businesses. Nashville’s advantages have attracted more diverse new business from across the country than any city its size over the past 20 years. More than 6,000 local industry employers call Williamson County, Tennessee home, including the corporate headquarters for 40 companies. 12 of the 25 largest publicly traded companies in the Nashville region are in Williamson County, including #1-#5 and #7 of the top 10. According to Inc. Magazine’s 5000 list, 33% of the fastest growing companies in Tennessee are in Williamson County. 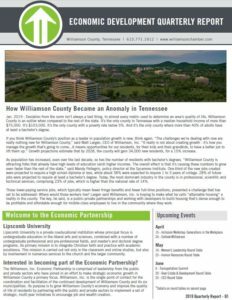 Williamson, Inc. Economic Development’s newsletter compiling recent economic development news. Click below for the most recent newsletter. Sign up for the economic development newsletter. 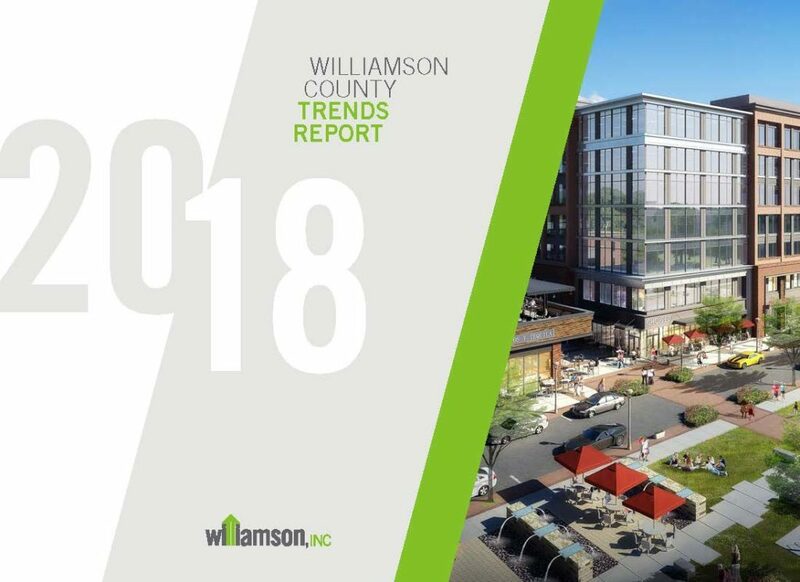 Provides a snapshot of the Williamson County economy, highlighting several indicators which can provide insight to the overall health. Indicators are updated regularly. Click to download. 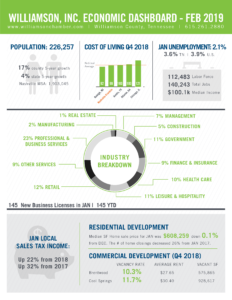 View past economic development dashboards here. Sustainability is important to Williamson County businesses and leaders. From LEED certified office buildings to green corporate policies, many local companies are committed to maintaining the high quality of life enjoyed by residents and businesses. These companies understand that implementing sustainable practices save money and respond to concerns of employees, customers and investors. 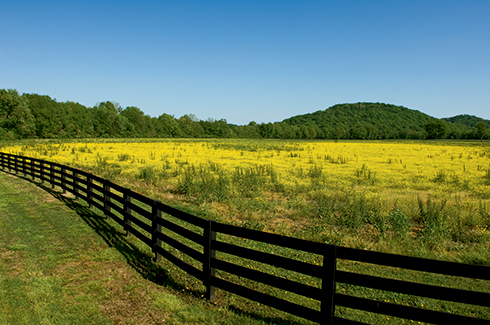 The City of Franklin, Tennessee is a designated Valley Sustainable Gold Community. Franklin is home to eleven (11) LEED certified Class A office buildings with green space and walking trails and 13 of the 25 publicly-traded companies in the Nashville MSA have their headquarters in Cool Springs including the 10-story 460,000 square foot Nissan North Americas building. The City is leading by example with a LEED Gold Police Headquarters complete with a green roof, a residential curbside recycling program, and internal energy conservation initiatives. The City also offers companies a Live Green Partnership program where businesses are recognized for their sustainable efforts. These ongoing programs led to the Gold level achievement. Read more here. See a list of LEED certified buildings here. Learn about TVA Sustainable Development Initiatives here. In 2004, The TMA Group (Transportation Management Association) partnered with Williamson County to form the Clean Air Partnership of Williamson County, a public-private coalition that coordinates the Air Alert Day program and educates all citizens about air pollution, as well as promoting the use of alternate modes of transportation. The Clean Air Partnership of Williamson County produces an educational television show “Air Care”.